Chocoholic Charity Penn must smoke out the killer to stop her newly inherited beachside chocolate shop from going up in flames in Dorothy St. James’ decadent follow-up to Asking for Truffle. Chocolate shop owner Charity Penn is finally settling into life in the quirky South Carolina seaside town of Camellia Beach cooking up chocolate treats. She’s even helped organize the town’s lively beach music festival which has brought rollicking crowds eager to dance the Carolina shag. That is, until one of the band’s lead singers is found dead beside a beach bonfire. While also trying to balance the amorous attention of music star Bixby Lewis, in town for the festival, and her quest to perfect a new hot flavored bonbon, Charity dives into the investigation. Though it’s more spice than sugar when she discovers a threatening note, comes across decades of age-old secrets, and Bixby comes into the line of fire when a gas grill explodes on the deck of a beachfront house. 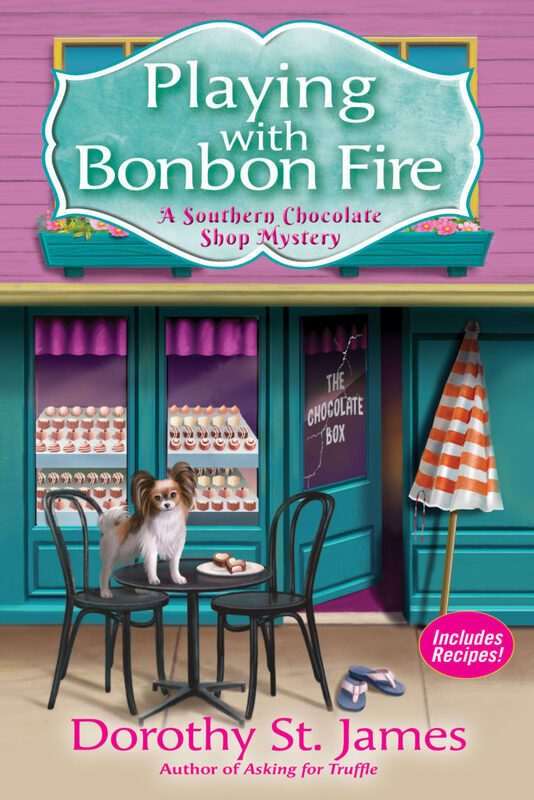 Now Charity must turn up the heat and catch the killer before her chance melts away in Playing With Bonbon Fire, the delightful second Southern Chocolate Shop mystery served up just right for fans of JoAnna Carl and Joanne Fluke. Mystery author Dorothy St. James was born in New York but raised in South Carolina. She makes her home on an artsy island community in South Carolina with her husband, a neurotic dog, and fluffy cat. Though writing has always been a passion for her, she pursued an undergraduate degree in Wildlife Biology and a graduate degree in Public Administration and Urban Planning. She put her educational experience to use, having worked in all branches and all levels of government including local, regional, state, and federal. She even spent time during college working for a non-profit environmental watchdog organization. Switching from government service and community planning to fiction writing wasn't as big of a change as some might think. Her government work was all about the stories of the people and the places where they live. As an urban planner, Dorothy loved telling the stories of the people she met. And from that, her desire to tell the tales that were so alive in her heart grew until she could not ignore it any longer. 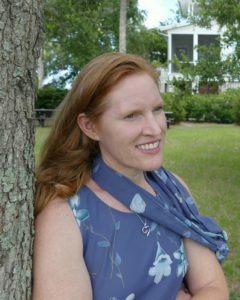 In 2001, she took a leap of faith and pursued her dream of writing fiction full-time. Known for the White House Gardener Mystery series , Dorothy is going back to her roots and setting a mystery series in a Southern beach town much like the one she’s called home for the past 20 years. 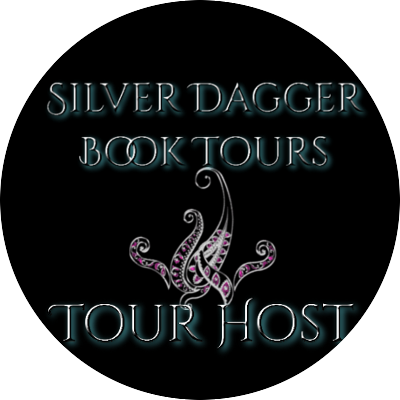 The Southern Chocolate Shop Mysteries combine her love of fine chocolates, quirky Southern charm, with a dash of danger. * Dorothy St. James is the alter-ego of the award-winning multi-published author, Dorothy McFalls. She enjoys writing in several different genres. Her works have been nominated for many awards including Romantic Times Reviewers' Choice Award, Reviewers International Organization Award, National Reader's Choice Award, CataRomance Reviewers' Choice Award, and The Romance Reviews Today Perfect 10! Award. Reviewers have called her work: "amazing", "perfect", "filled with emotion", and "lined with danger." Okay so I just fell in love with book. We get chocolate, a cute (though vicious) dog, enough family drama for a lifetime, and a mystery to solve all in one book. The chocolate shop alone makes it worthwhile but reading about Penn constantly failing at the treat creation had me giggling I must say though she really seems to have the original creation part down pat. This time Penn is helping with a big music festival that will be going on and her sister got her famous musician to perform for free. Well of course this brings lots of paparazzi and crazy fans with it. After the first concert a body is found dead on the beach under a bonfire and while trying to figure out what happened there lots of other strange things start happening until Penn is wrapped in all kinds of stuff. I was loving the emotional depths that this book took and the mystery itself was more involved then most as well. I think that all chocolate lovers should read this book/series and the cozy mystery fans in general. I loved every page and was actually upset that it ended so I give it 5/5 stars. 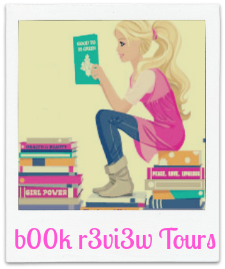 Book Blitz & Giveaway for Unravel by Aashna K.